Today (February 5th) would have been Mike Bartnikowski’s birthday. Unfortunately, he is no longer with us to celebrate. While I was living in Highland Park, Mike was a great influence in my life during my teenage years. The first time, I ever saw Mike was while I was a student at Ford Middle School from 1966-69. Mike was a seventh grade teacher, and I would see him walking down the halls with his class. You couldn’t miss Mike because of his size. Many of his students would affectionately call him “Big Bart”. I never had Mike as a teacher; so I really didn’t know him or even speak to him. My opportunity to meet Mike was when he started to work at Ford Park in the summers. I spent a lot of time at Ford Park even as a young teen because there wasn’t much else to do. I would play shuffleboard with the old men, play some table games, and play a lot of tennis. It was during these summers that I developed a friendship with Mike. Mike treated me as an adult though I was only a young teen. He would listen to what was going on in my life and he would share things that were happening in his life. I remember that he was quite excited when his daughter, Barb, was born. Unfortunately, I didn’t really appreciate Mike’s friendship and kindness until later in my life. One of the things that Mike greatly enjoyed was playing war games (mostly board games). Mike and I would spend time each summer playing some of these war games at the park. 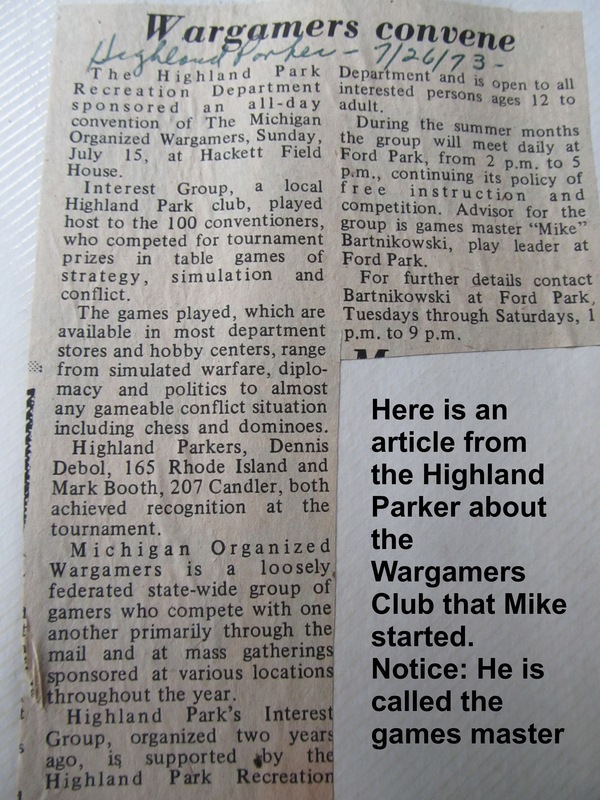 Eventually Mike started a war gamers club that met at Hackett Field House every Saturday morning. He loved the competition. One of his most favorite games was Diplomacy. He loved the deceit and backstabbing that was part of the game. Because of Mike’s very competitive nature, Saturday morning was the highlight of the week. Mike also enjoyed playing practical jokes. One evening at Ford Park, I was playing tennis when I heard this voice over the loudspeaker say: “Mark Booth, your mother is calling you!” Many of those playing were laughing as I ran off the courts to see what was up. Mike then comes up to me laughing because he had pulled off a brilliant prank. After I graduated from Highland Park High School in 1973, I never did see Mike again until 2011. Like many people, we were able to get reconnected through Facebook. I enjoyed spending a couple of hours with Mike and his wife, Barb. He talked about Ford School, the teachers in the school, some of his students, and he also wanted to relive his prank that he played upon me forty years before. I am glad that we had that chance to get acquainted again. During my last visit, Mike was surprised that I was a pastor of a Baptist Church. I shared how God had used him to greatly influence my life. I reminded him how through his advice, I was able to convince my parents to transfer me back to Highland Park High School after a very miserable ninth grade at U of D High School. This decision enabled me to eventually finish college early. If I hadn’t, I would not have met my wife, Sharon. I would not have gone to South Africa and Portugal. My two sons would not be in Portugal now. I could just go on and on. During my high school years I didn’t know how God was working in my life. I thank God for having an adult friend like Mike with whom I could talk. 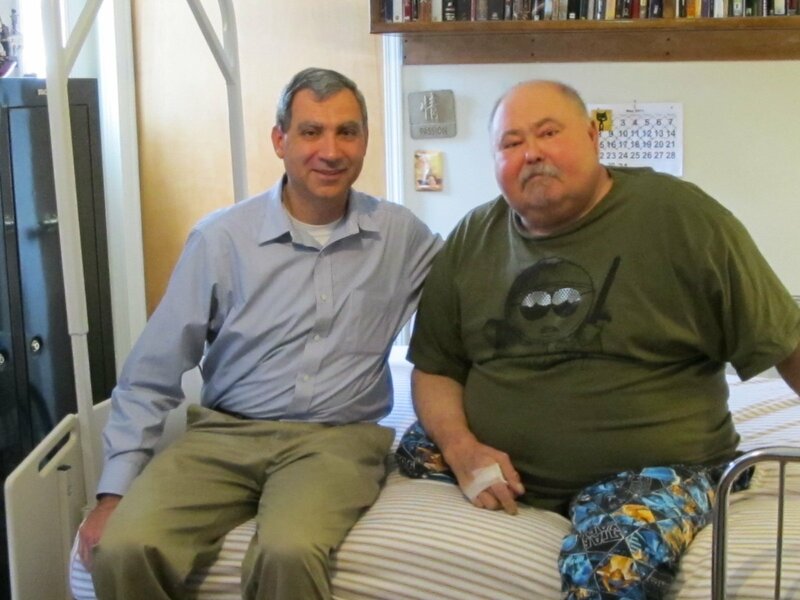 I am sure Mike didn’t know until my visit two years ago how important his role was in my life. Yes, Mike is missed by many, but I will not forget Him. God is still blessing me by having placed Mike in my life.